Atlantis Paradise Island is an ocean-themed resort on Paradise Island in the Bahamas. It features a variety of accommodations built around Aquaventure, a 154-acre waterscape, which includes fresh and saltwater lagoons, pools, marine habitats, and water slides and river rides. The property was originally part of the Paradise Island Hotel and Casino, which opened in 1968. It was owned by Resorts International, a Merv Griffin company. Donald Trump at one point owned a majority stake in Resorts International. He spun off ownership of the Trump Taj Mahal property from the company and sold Resorts in full, including outstanding debts from Taj Mahal construction, to Griffin. Paradise Island was purchased by South African hotel magnate Sol Kerzner and Kerzner International Limited in 1994, and Kerzner's new resort, comprising the Coral Towers and previously built The Beach Tower, opened officially in 1998. The property's name was changed to Atlantis when The Royal Towers was built. The Coral Towers and The Beach Tower were later refurbished to match the theme of the Royal Towers. On March 28 2007, a 600-suite luxury hotel named The Cove Atlantis opened on Paradise Island. Another tower, the 497-room The Reef, opened 19 December 2007. Currently, the property is owned by Brookfield Asset Management and operated by Brookfield Hospitality. In October 2014, Atlantis, Paradise Island became a member of Marriott International's Autograph Collection Hotels, which includes a marketing partnership with the brand in order for guests to earn or redeem Marriott Rewards at Atlantis. The Royal Towers, contains the "Bridge Suite", ranked in 2002 by Forbes as the most expensive hotel room in the world. The Bridge Suite, billed at US $25,000 per night, is listed at number 10 on the World's 15 most expensive hotel suites compiled by CNN Go in 2012. The Reef, the newest building at Atlantis, consists of condominium hotel residences. The Cove is a 600-suite tower that opened in 2007. Dolphin Cay is at the rear of the building. This hotel also contains Mosaic restaurant. The Mayan Temple is the grand icon of Aquaventure, with a height of over six stories. The structure features a series of water rides, including the Leap of Faith, a 60-foot near-perpendicular plunge that sends riders through a clear acrylic tunnel submerged in a shark-filled lagoon. Also located at the top of the Mayan Temple are the Challenger Slides, two high-speed dueling slides where riders race against the clock for the best times. From just below, the Serpent Slide spins out from 48 feet up the Temple and into the Temple's dark core before emerging through the shark-filled lagoon at a more leisurely “shark-viewing” pace. For a milder change of pace, the Jungle Slide meanders through exotic jungles and caves built in the heart of the Mayan Temple. The Rapid River is a mile long water ride complete with waves, artificial tidal surges, rapids, and environmental effects such as steam, special lighting, and waterfalls. The Falls and the Drop water coasters are accessible from The Rapid River without the guest needing to leave their inner-tube. The Rapid River has changed only slightly since its 2007 opening, with an optional rapids waterway closing. The Power Tower is the tallest feature of Aquaventure, at 120 feet tall. The tower is home to four water slides: The Abyss, The Drop, The Falls, and The Surge. The Abyss drops riders a near-vertical 50 feet into total darkness and through a tumbling waterfall, ending their journey in a deep cenote filled with Alligator Gars. The Drop, The Falls and The Surge are three inner-tube slides powered by “master-blaster” technology, which uses jets of water to create roller coasters of waves that propel riders both up and downhill at a fast pace. The Drop spirals through the Power Tower’s dark center, while The Falls drops riders down 58 feet and propels them up again through various turns. The Surge also drops riders into a cavern from the top of the tower before ending in a flash flood. For those under 48 inches (and their parents), multiple size appropriate rides can be found at Splashers, a children’s water play area and pool. Splashers is an elaborate Mayan-themed water play structure featuring two enclosed spiral body slides, one open spiral body slide, and a child-friendly version of the Mayan Temple Challenger slides nearby. Splashers also sports cargo nets and rope bridges for climbing in addition to water cannons, fountains, and water wheels for soaking. Other swimming areas for younger guests include the Ripples Pool, with miniature slides, and Poseidon’s Kid’s Pool, with fountains and in-water play structures. Atlantis is home to 14 lagoons and more than 50,000 aquatic animals representing over 250 marine species. The Dig simulates the 11,000-year-old lost continent and provides a unique look at the wondrous civilization, home to some of the world’s most exotic sea creatures. The goal of The Dig is to provide guests with a taste of life in the legendary destroyed city of Atlantis. If one observes the bottom of the floors in the different aquariums, wreckage and debris scattered about represent the "Lost City of Atlantis." A Predator Lagoon is full of sawfishes, barracudas, stingrays, and sharks. A 100-foot (30 m) clear acrylic tunnel runs underwater, allowing visitors unobstructed views of the marine environment. The Ocean Club Golf is a private 18-hole, par 72 championship golf course that stretches for over 7,100 yards. The course features a restaurant and bar located at the clubhouse. Many professional golf events are hosted at the Ocean Club Golf including the LPGA Pure Silk Bahamas Classic. The resort features a marina designed to dock large yachts. The eastern side of the marina features the Marina Village, which is a small shopping center reminiscent of market-style tourist centers, such as the Faneuil Hall in Boston or Downtown Disney at the American Disney parks. The center features numerous restaurants and stores, such as Ben and Jerry's, Carmines and Starbucks. The Harborside Resort at Atlantis is located on the south side of the marina. ^ "History of Resorts International, Inc. – FundingUniverse". Fundinguniverse.com. Retrieved 9 January 2019. ^ "On the Scene: Atlantis, Paradise Island, Bahamas". Meetingstoday.com. Retrieved 2016-08-17. ^ "Reef Atlantis". WhereToStay.com. Retrieved 2010-03-15. ^ "Atlantis resort in Bahamas joins forces with Marriott". miamiherald. Retrieved 2015-10-09. ^ "The World's Most Expensive Hotel Rooms". Forbes Review. Retrieved 2002-03-07. ^ "Ocean Club Golf". Atlantis Paradise Island. Retrieved 8 February 2015. ^ "Clubhouse Restaurant & Bar". Atlantis Paradise Island. Retrieved 8 February 2015. 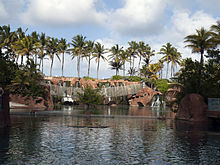 Wikimedia Commons has media related to Atlantis, Paradise Island.